Darren is pleased with his new home too. He says: “It’s been brilliant and the staff have settled me in really well. 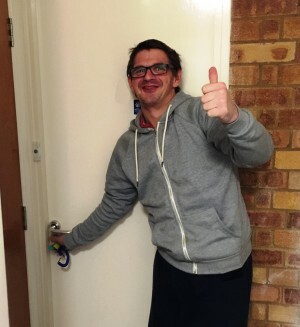 Cavell House customers get support, which Ben and Darren both find helpful. “I get support with telephone calls, paperwork and whatever I feel comfortable asking for,” says Ben, who says he values the way it gives him confidence. Darren welcomes having support on hand when he needs it and uses it mainly for “day-to-day things, like household bills, housework, emotional support and meal planning”. Now they are settled in, Ben and Darren are enjoying their new life and both say the people are the best thing. Darren always likes meeting new people and finds the staff really friendly. Ben says he feels comfortable with the people at the service and is getting along with them. The pair have a few words of advice to others moving to an Ability property. We wish Ben and Darren a happy stay in their new homes.